ãUNIQUEãFashion designed specially for SAMSUNG Gear S3 Smart Watch. ãMATERIALãMade of premium quality stainless steel, faux diamond. Hand-made craft, luxuriously comfortable. ãINSTALLATIONãEasy to install and remove. Secure snaps in connection make sure your watch securely. Adjusting size without link removal tool. ãWARM TIPSãWrist size fits 5.5 inch to 6.9 inch. Please measure your wrist before purchase it. This style perfect matching for girls and ladies, also is a good choice as gift. 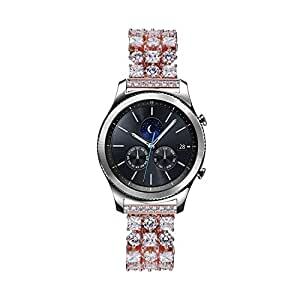 Handmade Luxurious Classy Bling Rhinestone Diamonds Replacement Band for SAMSUNG Gear S3 Smart Watch. Please notice that the package doesn’t include Smart Watch.